Started in the US as a fleet management system, generating savings and profits for customers in lump sum amount of dollars. 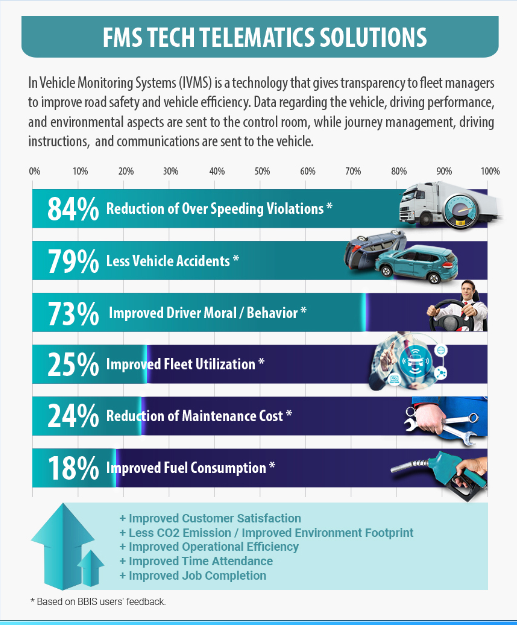 Fleet Management Systems and Technologies (FMS Tech) has successfully grown over the past years as a transport logistics, mobile asset protections pioneer and innovator of in-vehicle monitoring systems and onboard computers technology. Based in Abu Dhabi and Dubai since 2011, the technology and software provide vehicle tracking and information to increase road safety, good driving habits, productivity, profits and efficient fuel consumption. The technology company is the only IVMS/Telematics provider offering the hardware and software design, development, and integration in the Middle East. The IVMS device is a recorder that transmits operator behavior, vehicle diagnostics, and route optimization in real time through a secure cloud-based system. FMS Tech provides access to the cloud-based system and transmits alerts through the FMS Smart Track app for all smart devices. As for web browsers, users can simply log on to the FMS Office 2000 monitoring software via FMS Tech’s unique URL. In order to connect to the secure FMS Tech server, all devices need to be registered through an authorization code provided by the company.